Do you work for Git? Learning about Git? We can help. Git is a tool that every programmer should use, especially for the use and storage of repositories, which is one of its main features and I think that most programmers, we have used it once for this kind of work, the speed with which it operates this application is very high unlike others who want to do the same, the program has a very low weight, and works on almost any computer with windows or Linux, is very versatile, easy to install and use, is a great application that the developer community uses and keeps constantly updating. It is a very strict application, where you must do your work step by step, each thing must fit with the other, absolutely nothing can fail, because if everything fails goodbye, it is a tool that needs a great time of work, and above all details, You can not miss anything, because you can damage hours of work, just by a small calculation error, it takes a lot of time to read and learn about the correct and complete use of this tool, I have seen that several fellow programmers get bored easily of this application, and look for an easy way, just to avoid reading or document a little more, the interface does not like me very much either, it is very basic. It is a tool that needs a long learning curve, do not despair if when you start using the application you feel frustrated, because you do not understand some things, it happens to us all. It is a tool that gives us help for the development of different applications having as main feature the control of software versions. "The best version control there is"
The one fact that is best about it is the fact that it is simple, straight forward and gets the job done precisely. It is robust and dependable. It is open-source and cross-platform. Support is easy to find if you ever find yourself stuck in any problem. There is a slight learning curve, especially for people who are unaware of the core idea and reasons behind why version control is needed. This is perhaps what you may call the ultimate in version control. If you're in the software development industry or rather any field where tracking changes in files is of grave importance, this is the best product out there. Also, if you compare Git to SVN, it has few advantages that make it better, for eg. It is faster to commit since can commit offline and only commit to the central repository every so often which reduces load on the central server. Lastly, Git is open source and cross-platform, so there is a wide variety of support. 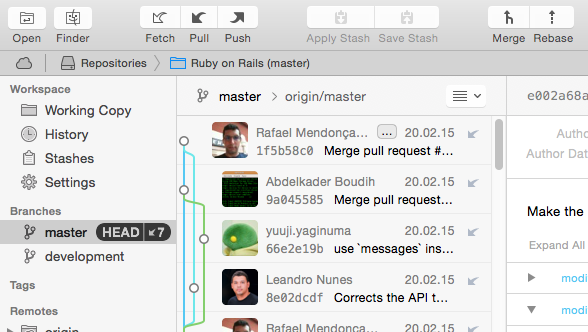 I am using using Git for version control and find it perfect for the required task.
" "The application" to control your versions"
The GIT application for version control allows us to work collaboratively with other programmers in a very easy way. All the changes we make are reflected in a final document. It allows us to return to previous versions in an easy and fast way, with a simple command we can return to the previous stable version. The branches allow us to work in parallel to the project, and to correct bugs or add new features without affecting the master. It would be necessary to integrate the ide with Explorer, it would add more flexibility. It is somewhat more complex to use than SVN, since it has a large number of commands. The biggest problem is that the code is in a single repository. You have to know the complexity and quantity of commands that you have to use to work with GIT. SVN may be easier to use at first, but GIT has much more power for large projects that you are managing. I advise GIT if you are going to do a big project, SVN if you are going to do a project on a smaller scale, with few developers. "The ideal version management system for projects"
Git is a software designed by Luis Torvalds, open source that allows us to have mirror versions of our projects and thus simplify the way to correct errors and effectively maintain a project in an orderly distributed and robust. it has great features such as focusing on collaborative work, that is, several people can modify, create or eliminate part of the project and versions of it in a structured and orderly manner, allowing generating workflows that facilitate the development of large projects. In comparison with other systems, the storage of information does not line with the objective of maintaining the image of all the files, all through ramifications of the project, another of its advantages is that most of the operations are carried out locally, which leads to another of the great advantages GIT only increases the changes to the files or directories that are modified, created or deleted, that is to say that it considerably reduces the time it takes to show the changes made especially if it's in the application in production, it should be noted that using this software it is impossible to make changes in the content of a project without being approved. Git also allows you to return to previous versions quickly and easily, return the project or files to the version you decide to return without taking into account any of the changes that were made after that version. 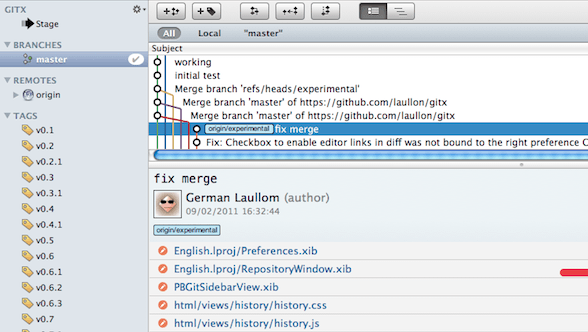 Git provides many tools that facilitate the work. As for security, it makes use of SHA1 tree systems, ensuring that until the verification of the number or signature is not made, no changes will be made. Git requires time to learn because it has many new concepts and orders. Probably you have a bit of difficulty at first to use the Git version control system especially if you aren't used to using the command line but it will be worth it especially when you need to return to an earlier stage of the project. Git will allow you to organize the code, generate readable code, work as a team among other things. Every developer knows that it's essential to have support of their projects at various points of their development, GIT was designed in a distributed manner which allows each developer to have full local control of the project, as well as having restoration points in case the latest changes aren't correct or the project should be modified from a specific point, git allows you to return easily through little commands, if you want to modify a project just clone it and locally make all the changes and tests you want. You can also observe all the changes you have made in your project throughout the development. How adaptable it is to any situation. It is essentially an all-inclusive package for everything you need when writing and commiting code as a team member. It's features are fairly simple to learn and crucial for maintaining any sort of version control in your applications. Not a fan of how not user-friendly it is. it is very complicated to learn all the ins and outs of the API, and even then it is hard to remember all the small details you need to be able to commit your code effectively. It takes many people months to learn how to do it properly, and even then they often do it wrong until corrected by someone who knows what they're doing. it would be amazing if they had a quality how-to video that went into all the small details of each command in an easy-to-remember fashion. Learn it early and learn it well. It is worth every minute. Solving version control issues. It is really good for testing out new features and branching different versions without having to manually separate the folders in your file system. This allows multiple team members to work on the same code at once without changing the underlying backend files. It also is very good if you need to rollback to a previous version because of bugs/issues/performance/etc. Having git means you can rollback incredible easily and also see where the problematic changes occurred. Every software developer should use git. This is the best way to track changes to a code. It is also very useful to see the changes that are made in the code. At first and as all its use can be confusing. Learning how to use it can be frustrating and especially when several programmers who are participating in the project do not know how to use it correctly. There is a lot of confusion when the project is starting and the changes are constant. Git should display error messages in more detail. He should even give advice on how to solve them. Also give an alert or warning before the code is damaged by a bad command. We as a company that develops software, we give the client the entire git repository and in this way see the changes made over time. This gives the customer more confidence. Another point in your favor is that there can be two codes circulating since it is extracted from git. "The defacto Version Control System"
A capable tool with profound insight into the concept of version control. A diverse set of command-line tools. I also like history rewriting and multiple origin feature. You can point your local copy to the local repository of a colleague rather than that of the server. Sometimes command line parameters are so lengthy that it is not easy to keep them easily in mind. Inconsistent behavior among versions. e.g. core.fileMode=true configuration flag causes git to consider many untouched files eligible for inclusion in the commit. There is no way to avoid downloading the entire commit history of a repository into the local copy. This harms performance of cloning when working with many submodules. You may be disappointed at first attempts, because you may have different image of how a version control should work. But in the course of time you will realize that git has a different and more practical approach to the concept of version control. "My favorite version control system"
It is fast to place changes in stage and commit them. Also the basic us of the application is very easy to use, even if you don't use the user interface. It is difficult for me to perform advanced tasks. Merge changes and fix conflicts must be done manually and the side by side comparison is not clear enough. Before us it is a good idea to take the basic training in order to understand the basic of the VCS. I think is the best option for track the changes in the text files like source code. Generate branches could be very useful but merge them could be difficult, some times it must done by hand. The tracking to the changes in the source code was a common problem in my team, the projects we work on are very large and also the developers works in more than one project at the same time. The use of version control system allows to everyone in my team to track their own changes and make the releases easier. Git is one of the most flexible, powerful version control systems I have worked with. Nevertheless, it is also super easy for a beginner to get started with! Combined with GitHub, Git is the unmistakable winner on sharing, collaboration and open-sourcing. Each time a team member makes a change to the code Git shows the exact changes. Git is overall a great log/tool to track the changes during the course of a project that requires collaboration. Not to mention it is easy to use. Every company should use this. It is by far the best version control system. Very maintainable and robust. Command line utility is just super amazing. Squash commits is the best feature. Also, rebase is something very interesting. I can go on and on this is the best version control ever. Nothing. Everything is perfect. Just one small thing is that the command line utility is stronger (UI for this could be made better and easy to use). It is by far the best version control which is easy to use with good quality support and excellent features. Please try this out before using any of the other ones out there. Using git for version control and command line to push code changes, rebase, merge, stash, squash, etc. "Git is basic in programming"
What I like the most about Git is the possibility of keep track of the changes thst are being made in the code, and also being able to easily get back to a earlier commit. What I dislike about git is that commits are no very easily to manage unless you have a compatible ui tool. The main problem that git is resolving to me is dealing with doubtful clients that ask for changes on theirs web, then they didn't like them and want you to get back to what they had before. With Git this is si much easir to manage. "Does abny other Version Control System exists?" "Version control for all your needs"
- It is free and open source. - It handles from the most small personal pet project to a very large project. The have a big community and you can find always the solution for your problem. It is distributed, that does mean that allow your team to work separately and disconnected. I think is the best version control tool, and if I to say something that I dislike perhaps is the understand the concepts of local copy, stash, loca repository and remote repository. Try it, and also try to understand what is different from the others version control systems. The version control of my personal projects and also the professionals. "Git - Free, secure, concise, version control for all"
I like that with Git using the command line interface I have full control over all my interactions with the Version Control system. A recent addition in support of Git is it's integration into Microsoft's Visual Studio, Microsoft's Team Foundation Server and Microsoft's Visual Studio Code. Though the command line interface is powerful it is also daunting for those of us that are used to GUI. fortunately the git --help command is very helpful and points discerning developers in the right direction. At Kizan we use Git to help us manage the version control of source code for many large custom software development projects. It gives us one less thing to have to worry about. Git takes care of it all. Git is also cross platform so it doesn't matter if teammates are using Windows PCs or Mac Books. Git is very widespread. I think nearly every developer has some experience with it, so it makes a good medium for exchange of and collaboration on code. Its popularity also makes for the availability of a lot of documentation and help. And it does the job for which it is intended. My biggest complaint, in my own opinion only, is that resolving merge conflicts is harder than it should be. Also there seems to be more "religious wars" than there should be about how to accomplish some fairly common tasks. Lastly, at least in my own experience, discoverability (search) stinks. Can't go too far wrong with Git, unless you really need to squeeze the last ounce of goodness from your version control system, in which case you'll want to investigate whether some of the more modern alternatives fit your needs better. Git, along with some continuous deployment tools, gives us a single source of truth for our software; a focal point for discussion; a process by which experienced developers can help those with less experience in a particular area. Its popularity makes it easy to bring new people on board. The Gitflow workflow that we use helps us manage our development efforts and keep straight our various software versions. It is very fast to use, branching is very simple once you understand how it works. It is a tool that you must use it. There are several git servers in the market and some of them allow you to create private repositories for free. Several times I need to Google some commands because I don't remember them but I think that is the price for having such a powerful tool. "Git is incredible for keeping track of source code changes"
There's not much I dislike if anything i'd say looking a diffs in a terminal but that's something ill need to brush up on it's not really a dislike i guess. "Easy to learn but difficult to master"
Git is very popular, so the community surrounding it is plentiful, which translates to being easy to find tutorials and QAs regarding most of the issues you might find by using it. For plain text files, it's extremely useful and optimal in terms of performance. For starters, the documentation needs improvement. Native merge conflict display can also be a pain to handle, so the use of third-party is highly recommended. Furthermore, it's not suitable for large binary files, which is something valuable in game development. Git serves as my preferred SVS for my indie game projects, as it's been easier to learn than other systems such as Mercurial and SVN. I like GIT specially using it in terms of development, I often use the command line interface in Linux and Windows. the program is very portable and cross compatible with different operating system and servers. I use GitEye and TortoiseGit when I want to see the commit history, the branches and tagging visually. It improves my code organization and best when am refactoring code. Git is highly recommended as a version control tool for developers. Version Control is very crucial in terms of developing large code base programs, specially apps or programs written in C/C++ in which are very messy. I've written code and used the version control features of GIT on languages like PHP, Node.js, C/C++ and HTML. "Reliable, distributed version control for everyone"
Since Git is a _distributed_ version control system, every copy of the repository works as a standalone repository (there is no "one true master" copy of the code). This makes scaling projects easy and means everyone working on the code has, in a way, backed up the codebase for the team! Working with the Git CLI can be a bit cumbersome. The GUI tools available don't make it an easy system to learn, either. The learning curve for Git users is super steep. Git is heavily biased towards command line users or those who are incredibly comfortable working with minimal instruction or support. Introducing it to your development team will require at least someone on hand to answer questions and lend support when other engineers get stuck. We house all of our code in Git repositories, many hosted online via services like GitHub and BitBucket. We also use Git to collaborate directly with one another in a team setting, making code sharing incredibly fast and not reliant on the stability of an online vendor. "Git. A kernel developer over-engineered something simple, but its all we got." git can do anything. Which is a good thing, but truth be told, most people just need a simple workflow. I guess the best thing about git is its everywhere. Everyone knows it. You don't need to teach anyone who joins the company how to use it. (Maybe help out here and there when they have a confusing merge or cherry pick or rebase or something), but in general, every developer worth a grain of salt knows git at a basic level. What's good is that its fast, efficient, and cross-platform. There many tools built on top of git too. You know the unix philosophy? Every tool should do 1 thing. Git has a different philosophy. "Lets see how many program flags we can give a single binary." Its just too confusing for beginners. Some people have learned the intricate ins and outs over time, and I pity them, because who cares... all anyone ever wants is too pull, push, edit, merge. Yet git so many quirks that everybody ends up wasting time googling super simple things just so they can go to the first stackoverflow question upvoted by 10 million people so they can copy and paste the obscure poorly named flag. Simply put, git is a tool only an engineer could love. But maybe I'm not a true engineer, because I just want to get things done. Don't try to learn it all. It's a waste of your time. There is so much more interesting things to spend time learning, and becoming a git guru is not one of them. I recommend you just work on a project and use git based on what you need to do. Eventually you can create shell aliases and just use those. Then you stop thinking about git and just do what you need to for your workflow. Like I said, git is like air. You just don't program without it in 2017. "Perfect tool for source control." The tool allows to maintain a proper history of source code and helps in version control of the projects. Keeps a log of previous versions and helps revert to any stable version in case the ongoing development breaks the stable one. Helps team collaborate with the help of various UIs for git like GitHub, Gitlab, Bitbucket etc. Allows creation of branches and creation of pull requests for team members to review before merging code into the main development branch. rolling back to the previous commit is a bit complicated for beginners as it is a bit too risky and can lead to major losses in the work. Git is a really great tool and one should definitely consider exploiting its services and usages to the full. It really helps understand the work environment in teams and how should one maintain their work in conjunction with others. Also, it prevents you from losing your work in case any mishap happens or you accidentally override the functional code. Git is being used for collaboration of teams of developers testers as well as other entities so as to contribute towards various products and deliver a fully stable end product. Git has seamlessly allowed maintenance of the functional products and thus contributed towards maintaining the software development lifecycle stages. "Git good for source control, especially decentralization"
Git allows you to have a local copy of the source code, you avoid the locking problems that CM programs like ClearCase have, and it's generally not that hard to use. I mostly use Subversion at work, which is great and has most of the advantages that Git has. Subversion is easier to use and setup than Git, but the whole decentralized repository aspect of Git allows you to commit changes locally when not connected to the server with your repository, which is nice if you aren't connected to the internet all the time. Git is also hugely popular lately, so you'll have tons of support for any questions you have. The learning curve on Git is steeper than Subversion. It's not as intuitive and you need to spend some time learning how to use it properly. Take a look at Subversion as well, both Git and Subversion are similar and are good options for CM tools. Git is a configuration management (CM) tool used to provide source control for software. If you are writing software for anything other than playing around at home, you absolutely need to have CM control. The benefits include being able to look through the history of updates made to the code by you or anyone else contributing to it, being able to create a specific release version of software and recreate the source, and the ability to check what you've changed before updating the source code. It requires you to read through a lot of documents in order for your to fully utilize the potential of git, though it is just a preference between software developers because sometimes; you don't need that much to do a lot. "Git is one of the most popular SCM solution available today!" Git is one of the most widely used and popular Version Control System. Though it is provided as a free software, it is still one of the most popular ones and arguably one of the best. Older Centralized SCM systems had many disadvantages and Git's distributed Architecture makes it highly advantageous. There's not much to dislike about Git but the availability of Advanced Options makes it a complex tool if you want to go deeper. The resolution of Merge Conflicts is one of the most tedious tasks in Git and there need to be made some innovative changes that make Merges easier for non-advanced users. We are using it as our primary SCM and VCS tool and have no plans to change to another tool in the near future. It's widely considered the standard for source control these days, so a number of handy gui tools to help visualize your git usage exist (e.g. GitKraken, SourceTree), making it easy to teach beginners about proper version control processes during the development life cycle. On the same token, more experienced users can easily access it from the command line making it faster and more efficient if so desired. It also has great free remote storage options that support it (e.g. Github and BitBucket). When not integrated with a gui tool, more complicated actions like settling merge conflicts that occur from re-basing (among other things) can be difficult to visualize and correctly fix. If you've never used it before, get a GUI tool that integrates with Git to get a better grasp on what is occurring when you perform certain actions. Version control is necessary for the success of any development team. Inevitably someone will over write another person's changes, or someone will push broken code to production and a roll back will be needed, or a bug fix will come up that's completely unrelated to the current project and somehow needs to get into production and included with the current changes so you don't risk the new project deployment overriding the fix once it's ready to be deployed. Version control solves all of these problems. It gives developers the ability to go "okay, this broke, what changed?". Without version control you don't know what changed or who changed it without having a number of backups and spending an exuberant amount of time tediously going through work line by line with a fine tooth comb to discover this information. Git helps you solve these issues 100x faster without a migraine. I really love Git's distributed model (I have a copy of the repo, github has a copy of the repo -- my collaborators have a copy). It makes working with the code really easy. I love how git allows me to clean up my history before I push it to a remote repository. I love how I can visualize changes with third-party tools (e.g. git-x) before pushing and how I can understand the evolution of the code more cleanly. Git has a steep learning curve. If you're not up for putting in a little time to learn the different workflows that work well with git, then you're probably in for a lot of pain. We write code. Having a version control system is critical and git allows me to work with the code in ways that other VCSs lack. Pair that with the abundance of third party tools (e.g. git-x, github) for working with `git` and it makes things like code-reviews so much easier than if I had to send patches around or if we were all working with a central repo. "Best version control software out there"
Simple, easy, and fast. Tons of documentation and tutorials out there so it's easy to ramp up your team on how to use it. Plenty of UIs built on top of it too. Git is the dominant version control system at many companies so it is a valuable skill to have on your resume as well. - It can become slow when handling binary files - it's not the ideal software for collaborating on e.g. a Word document. Git is the best version control system I have used. It integrates nicely with IDEs and other development tools. It has an enormous community providing support and software for it. It goes hand in hand with Github, the most common way for sharing open source code on the Internet. I've used Git for version control at many companies in the past. It makes collaborating on software easy. It allows thousands of engineers to contribute to the same codebase without overwriting one another's changes. "While I haven't used other SCMs my experience with git has always been AWESOME!" The best thing about git is its ease to use. Sure there can be tricky things(merge conflicts etc) sometimes but git can be used by both beginners and experts alike because of its ease to use. Probably that sometimes there can be way too many concepts to learn if you dig deeper. But I guess that comes with a tool with advanced features as well. If you are a a beginner stick to basics. Can't disclose much because of agreements but you can say mostly e-commerce. The benefits are realized best when combined with a review tool. It makes code development and review so easy if used correctly. "Project collaboration - made easy by Git"
The best thing to like about git is the ease of collaboration among team members. Team members can work on their own, keep committing in their own branches without the fear of conflict. Merging can be done only at the end when all the members are done. So team members can keep working independently. Besides version history is another great feature. At any time, you can go back to see how your code looked like in past. Conflict resolution process is not friendly. Sometimes, it really takes some real good deal of time to fix the conflict. Git is definitely a better choice for version control of your source code. It maintains your history of source code in branches, therefore, it is very much easy to look back into your code history. The branches keeps your code version organized. In addition to keeping your code history organized, the branches also makes it easier for the collaboration of your project among all your team members. Each of the team members can independently work on their own branch and merge only at the end. We are using git for the development of the core product of our company. We create new branch for each of new feature required. All the code changes are made to the same branch. Quality assurance testing is done in the same branch. Finally when everything is verified, the branch is merged to the master branch. 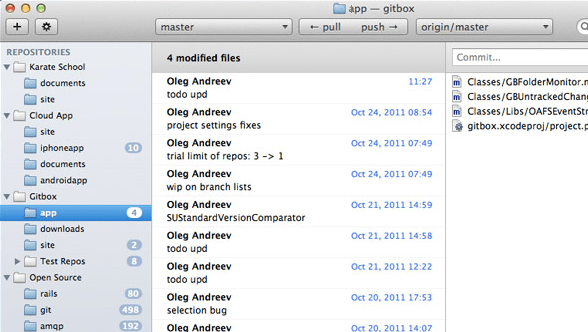 Git itself is a great way to implement version control for your code. It is widely adopted and so there are plenty of resources available to learn how to use Git. It can be confusing at first, but after understanding some of the reasoning behind the command syntax, it is well worth the trouble to use Git with your projects. The Git Bash and Shell that are installed with Git are terrible. They are not intuitive at all and can significantly increase the amount of time and effort it takes to get something done with Git. However, being so widely used, this can be countered by using a variety of software with Git integrations. Text editors (Sublime Text), shell emulators (ConEmu), and remote repositories (GitHub, GitLab, BitBucket, etc.) are all available to replace the atrocious nature of Git Bash and Shell. Take some time to get to know the nuances of Git. Having a thorough understanding of the reasoning behind many decisions in Git will simplify the workflow that you follow. In addition, identifying good resources to couple with Git in place of the Bash and Shell installed with Git will significantly improve productivity. Overall, Git is a good thing to know as it is widely used in the industry and for personal or open source projects. Git is all about version control and code management. And it does a great job. You are able to track your changes easily while still being able to revert changes that may have caused issues. Branching provides a great opportunity for separation of work and coordination within a team. "Great tool - poor UX"
The biggest advantage of git compared with similar tools is its distributed nature. Being distributed means that you can use it without needing a serve running and thus becomes an excellent candidate when starting your own project at home and scales very nicely as well later on when you wish to have more collaborators. Other advantages is its power. With git you can do pretty much everything ("edit history") but unfortunately the usage of the tool from the cli starts becoming less friendly. Usability. The more power, the harder it is to provide a friendly interface. Git from the command has a steep learning curve if you want to do something out of branching, commiting and merging. Even those can be somewhat confusing since you can do the same thing in different ways. There are some external tools like git-flow that alleviate this issue but I think that git could still be more user friendly. Great free tool that pretty much everyone uses. Scales great from a personal project to a huge one with many developers. A lot of power and customization as well! Revisioning development of software and web for both personal projects and daytime work. Once you've got a godly understanding of how git actually works, you can manipulate your commit history to be exactly how you want it. It's completely decentralized so you don't need to lock files, or sync to a server if you don't want to. It's light weight (branches are just labels pointing to commits) and you can init a repo where ever you want. The ability to add hooks add another level of power to having your repository. The learning curve was large. Having someone explain how git works really makes the experience much better. Learn the more advanced features of git, like patchmode add or interactive rebase. Source code repository. Version history. Git is really fast. Branching is super quick. Having a commit history rather than a file revision history makes sending commits and integrating pull requests very easy. I also use git in random places. Because of it's small footprint if I'm messing with a ton of config files on a system, i might init a repo in a folder, add everything, and then start changing the files. I can keep a version history and it's all self contained within the .git folder. "essential tool for project collaboration"
it's simple and productive. A thing I really like about Git is that it's very intuitive and has a good documentation, so you can get into solutions fast. It's an essential tool for project collaboration and code versioning. I'm using it to control versions of several private and opensource softwares. It's simples to keep projects working with lots of engineering concurrently coding on it. Git is a feature-rich, dependable, flexible and all-encompassing versioning software. With sufficient experience, one can use Git to become excellent at efficiently developing code, maintaining it, and correcting mistakes as needed. Git can be quite hard to learn at first. Until you are very proficient, mistakes with Git can be VERY stressful. What adds to the complexity is the fact that there are many ways to achieve the same outcome. To know the actual difference of those routes, you have to have deep knowledge about how Git works underneath. Take the time to learn Git on the front-end and save yourself a lot of stressful situations. Be slow with your actions unless you are proficient. Get personal with the way you use Git, develop your own sequences of commands and you will learn as you go. Source code history and versioning. "Really good software of versioning and revision control distributed"
In fact, I do not dislike anything of Git. Maybe I can say that it is a bit difficult to understand at the first time, especially if before you have worked with another versioning and revision control tool. However when you get the Git's methodology all these problems disappear. From my point of view is the strongest software of versioning and revision control distributed that we can use nowadays. Obviously, the problem that Git solves is the need to have a software of versioning and revision control distributed and with this tool it could be possible. It is source control with a lot under the hood. I am also a big fan of the bash command line that comes packaged with it. The complexity, trying to merge your branch or any code for that matter for the first couple times is very intimidating. Because it is all via the command line primarily it can be hard for new users to adopt without taking some kind of class. Managing differences in code. The ability to go back and look at the changes that you made a few years is invaluable. Because Git has such a large user base, it has a plethora of support around it and is going to be supported for a very long time. "This is an awesome tool for source control with tons of power"
The fact that you can do everything from the command line if you'd like. That it is universally integrated into just about every IDE if you would like to do it that way. The fact that you can usually find out how to do anything with a Google search. Sometimes there is more than one way to do things and that can be a little confusing. Learn the command line, it will make your life a lot easier! It makes Agile development with multiple developers working on multiple features very easy because we can branch and merge with ease. Also pull requests give us built in code review which is awesome. Git is used everywhere, so learning it is largely worth it let alone for this sole reason. Fortunately, it's also a powerful and versatile tool. It is regularly updated with new nice features. The ecosystem is amazing (GUI, web sites, Stackoverflow answers, integration in IDEs). The initial learning curve is quite steep, but there's a host of online documentation to help the novice. And many tools (text editors for instance) hide part of the complexity (e.g., Emacs, VS Code). Make the transition! It is no so hard, and totally worth it. I'm saving my own data with Git, just in case my machine has a problem. I'm sharing work with all my colleagues. I'm contributing to other pieces of software, especially Free Software. Powerfully track versions, whether in a group or personally. Can be slightly complicated at first with a learning curve, but there are plenty of guides and tools out there to help you learn it. Use git. It will help the development process, and it is simpler than you make think. Any software I develop uses git. "It's my go to for version control." I like that it most of the time knows how to merge intelligently when both the upstream and my copy of a file have been modified. There is still some times when you need to perform merges by hand, when the conflict is just can't be done automatically. I like the ability to cherry-pick from one branch to another and I like that you can just add an entire directory of files at once unlike some other VCS solutions. Some of the more advanced things you need to do, you'll have to Google to figure out the commands. It's pretty much standard these days to use VCS tracking and repositories for software development. Git is the most straightforward to use. "The best tool for version control"
After using a centralized VCS, Git comes in handy because you don't have such thing as a 'blocked' file in case you need to make a little change in other peoples' files, so you can test your own. Configuration in both Windows and Linux is plain and straight. Besides, there's this awesome community and documentation online. It's one of the key points I look for when deciding to use a tool for production environments. Git, however, gets really slow when dealing with repositories above 1GB. When you're used to used Git via command console like me, it's pretty troublesome waiting more than a couple of seconds for the operations to take place (because they usually take 1 second). Git is probably the number-one tool for version control. It has a great community on which you can rely on, and the best thing you could do is learn git from the ground up via bash or command line. Then, start using GUI tools such as Sourcetree, GitHub for Windows, etc. It could be a little slower at the beginning, but it pays off in the long run. I'm a game developer, but I've also worked as a web developer.